Old dirty army radio from cellar of your senil grandfather?? Neverrr!! Luxury, ancient vacuum tube jewel! ya fakka! and that's it. Pure rock n roll fakka.......! Why not to combine the quality and possibilities of digital sound with a heat, grandiosity and charisma of vintage analog vacuum tube machines? 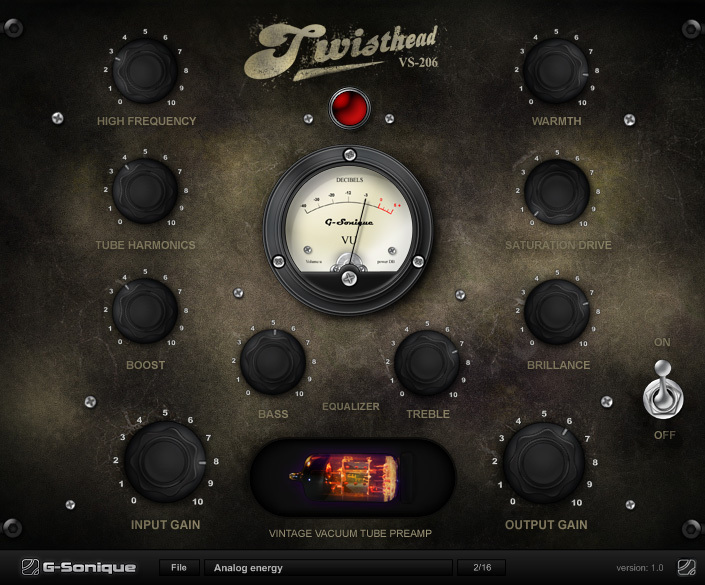 a fakinn emulation of vacuum vintage preamp from 60's!!! Its price rises every day thanks to its inimitable sound! But now… it's available for masses!!! UltraFat, dirty or clean, crispy, warm, colorfull sound! This machine behaves like a real analog hardware! It behaves in non-linear way and unexpectedly. Turn one knob a bit and other knob changes its behavior. Input drive affects the resulting sound as well as reaction to values set on each knob. You know these characteristics from analog vintage machines only! whether you create house, trance, hip-hop or drum and bass. Don't play boogie and download the demo, ya fakka! device - the level of saturation of signal, amount of higher harmonics etc. Limitation of the demo version: short noise sound about every 20 seconds.